Coconut roasted sweet potatoes. Don’t you just love this time of year? Time to enjoy roasted vegetables of all kinds. And how about them sweet potatoes? Wedges is where it is at. The edges get a little crispy and browned and the centers remain soft and tender. So good! The result is a flavorful and nutritious fall dish that’s easy to prepare and served up for lunch or dinner in well under an hour. Sweet potatoes have been a staple in my kitchen for about as long as I can remember. Growing up, they were pretty much only baked or mashed. But there is so much more you can do with them! Have you tried sweet potato toast yet? It’s toast without the toast. Normally I would throw a slice of my super easy gluten-free seed bread in the toaster and top it with avocado, but you can also toast slices of sweet potato and top it with anything you might otherwise put on toast. 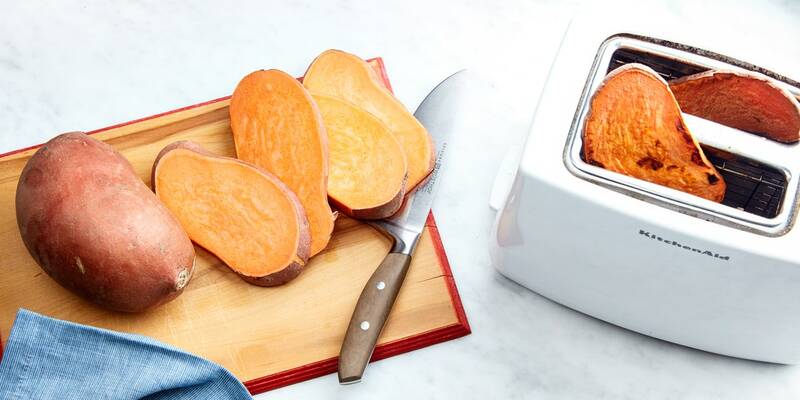 Because sweet potatoes are loaded with beta-carotene (which converts to a whole lot of vitamin A) and are a good source of fiber sweet potato toast toast makes a nutrient-packed and delicious breakfast or snack — that’s also gluten-free. That’s right, add it to the list! This hearty coconut roasted sweet potato and quinoa salad features crisp and tender roasted sweet potatoes, toasted cashews and a super flavorful, chili-lime dressing. It makes for a great light lunch or dinner on its own, or a side dish. Naturally gluten-free. 1. Preheat the oven to 425°F / 220°C and line a baking sheet with parchment paper. 2. To prepare the sweet potatoes, transfer them to the prepared baking sheet and toss them in the melted coconut oil. Arrange in a single layer and season with salt and pepper. Bake for 25-30 minutes until golden and tender, tossing halfway through. 3. Meanwhile, rinse the uncooked quinoa in a fine mesh strainer. Place in a medium saucepan and cook according to package instructions, for about 15 minutes. Once most of the liquid is absorbed and the quinoa is light and fluffy, remove from heat, fluff with a fork, and let stand for another 5 minutes. 4. While the sweet potatoes and quinoa is cooking, toast the shaved coconut and cashews (I do this in a skillet, first the coconut and then the cashews). 5. In a small bowl, whisk together the lime juice, fish sauce, sugar, sesame oil and fresh chili. 6. Arrange the coconut roasted sweet potato on a serving platter, sprinkle with quinoa, drizzle with dressing, and garnish with the toasted coconut, cashews and fresh herbs. Serve immediately and enjoy! It is also fine to leave the skin on the sweet potatoes. Just make sure they are organic. Of course sweet potatoes taste awesome any which way you cook them, but if you want to change this up, butternut squash would be a great substitution. I really loved the dressing for this coconut roasted sweet potato salad and almost wish I had made more quinoa to soak up up its delicious flavor. So feel free to increase the amount of quinoa to 1/2 a cup (100 g) and even make more dressing if you like! If you make this coconut roasted sweet potato and quinoa salad, I’d love to hear how it turned out for you! Be sure to rate it and leave a comment below to let me know! Especially if you have tips for other readers. Or take a picture and tag me on Instagram @ellerepublic and don’t foget to hashtag #ellerepublic so I don’t miss it! I’d love to see what you cook up!